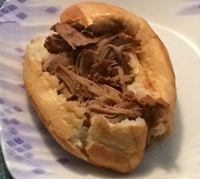 I have multiple slow cooker pork recipes in my database and I have tried several. I added this one after Terry and I saw Jeff Mauro demonstrate it on The Kitchen. The online recipe specified crisping the pork under the broiler, though on the TV show Jeff used a Panini press. I did neither. The recipe specified using tortillas. I served it with deli rolls instead. It wasn’t the best slow cooker carnitas I’ve made, but it was quite good. So, give me your BEST carnitas recipe! I love carnitas tacos! Just meat, cilantro and touch of salt in a soft tortilla!